"Modern automobile fueling areas are designed with high-speed self-service pumps, enabling customers to fuel their vehicles faster than ever before. 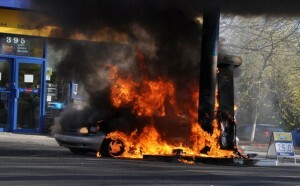 However, the same modern equipment that makes fueling Site and easy also makes the fueling area more susceptible to fire.​"
Customers might drive away without returning the nozzle to the pump or use the nozzle incorrectly resulting in a spill. Modern high-volume pumps can discharge a large quantity of flammable liquid onto the fueling area very quickly. Burning cigarettes, running engines, sparks and other heat sources can ignite the flammable liquids and/or vapors very Sitely. All State Fire Equipment will install a Pyro-Chem Fire Suppression System specifically designed for today’s modern fueling stations. The ATTENDANT II gasoline station system is on duty 24/7 to help protect your customers and your investment. And you can rest easier knowing your ATTENDANT II system was manufactured by a company that’s been in business since 1920. Designed to meet the requirements of today’s convenience centers, the ATTENDANT II system protects higher canopies and a greater number of pumping islands. 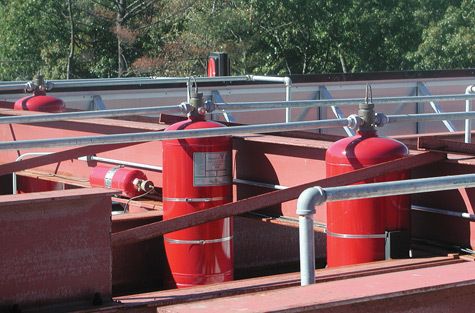 In short, it offers the most up-to-date fire protection available. The ATTENDANT II system has been specifically designed and tested for windy conditions. 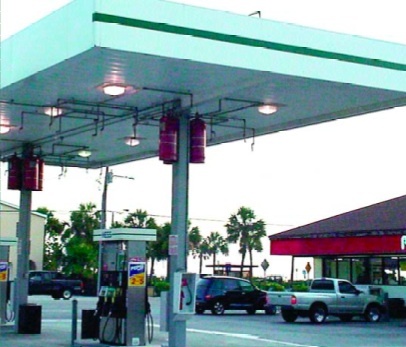 All gasoline station island/dispenser configurations can be accommodated.